2. Four load working modes: Pure lighting control, lighting control & timing control, hand operation and debug mode. 3. Scientific management of battery: as it is overcharged, the battery will get booster tension charge. As a result compulsory maintenance is available for the battery. In normal working state, the direct charge and floating charge are both available, so that the battery life-span is increased. Besides, the adoption of high precision temperature compensation makes the charging more accurate. 4. Comparing with the charging loops using diodes, the one that adopts double MOS series circuit control makes the voltage loss dropped by 50%. With the PWM fuzzy control in charging, the charge efficiency is improved a lot. 5. LED screen shows the working state of solar battery, storage battery and load. LED shows the adjusted parameter. In this way, users can learn the operation state in ream time. Besides, there are various choices for parameter; users can select the proper working mode based on the different conditions. 6. Various protections include over-charge, over-discharge and over-load, as well as unique electron short circuit protection and connection-reverse protection. All the protections are harmless to any parts and fuse. TVS thunder proof protection is also available. Non wire jumpers design improves the reliability and durability of the products. 7. Technical grade chips and precision components are adopted for all the controls. Therefore, the controller performs well in very low and high temperature, as well as humid environment. At the same time, with the use of crystal timing control, the timing function of controller is much more reliable. 8. Digital LED display and one button setup make the device easy to handle. 9. Discharge rate revision controls: Different discharge rate matches with different cut-off voltage, which is in compliance with the characters of storage battery. Through the computer chips, the controllers take samples from the parameters of storage battery voltage, photo battery, discharge current and environment temperature, and then use the dedicated control mode calculation to control the discharge rate and make it matched with the characters of storage battery, realize the high accurate temperature compensation. PWM fuzzy charge mode and 7 phase voltage control are available for the storage battery, so that storage battery is always in the perfect working state .The various working modes of controllers can meet customers’ different requirements. 2. Leads: the leads must be matched with the current. The length of stripped leads at the end of controller should be about 5mm. The longer the leads, the more the loss. 3. The connection to storage battery: Pay attention to the “+” and “–” in case of reverse connection. If it is connected well, the indication light will be on. Otherwise, please check the connection. 5. The connection to load: connect the leads with load of controller. The two interfaces are in parallel connection, and the total current must be less than rated current. Pay attention to the “+” and “–” in case of reverse connection which may damage of the device. ①. 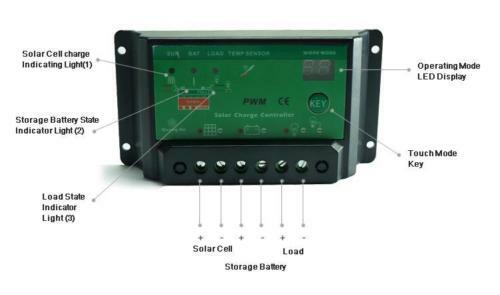 Charged state indication: the solar indicator light is on, as the input voltage of solar battery panel reaches a certain point., as the storage battery is charging. The indicator light will flash quickly, as the system is over voltage. ②. Storage battery indication: when the battery is under voltage, the indicator light is yellow. Over-charged for more than 10 seconds, the indicator light is red and the load is off. In normal working state, the indicator light is green..
③. Load indication: when the load is in normal working state, indicator light is on continually. In over current, indicator light flashs slowly. In short circuit, the load is off at once and the indicator light flashs quickly. While the current is more than 1.25 times of rated current or more than 1.5 times for 5 seconds, the load of controller will be off. in the LED changes along with every key-press till matches with the model designated by customers. To finish the setting, please wait until the LED stops to flash. Or just press the button for 3 seconds. ①.Lighting control: without sunshine the light intensity decreases to start point. Then the controller recognizes the start signal after 10 minutes. Based on the parameter, the load is on. While under sunshine, the light intensity increase to start point, and then the controller recognizes the close signal The load is off. ② Time control: The starting procedure is the same with that of pure lighting control. Timing control is dual period control; hence the double load can be regulated respectively. The load-on and load-off are alternated till the load is off in daytime. The time for the load-on and load-off can be adjusted to realize the different control effect. If the time for load-on is zero, the load will be off at night till the time for load-off is past. If the time for load-off is zero, the control effect will be the same with that of pure lighting control. ③General mode: Regardless of the daytime or night, users can control the load-on and load-off by key-press under this mode. This mode is used for some special load or regulation. ④Test mode: this mode is designed for system regulation. It is almost the same with pure optical mode except that the cancelation of 10 minutes delay (Please refer to pure lighting control). The load is on with optical signal. In reverse, without optical signal, the load is off. This feature makes it easier to check the system installation. Test mode, lights on after it detects no light, lights off after it detects light. Over-load protection: when the current of controller is 1.25 times of the rated current, the controller works for 30 seconds; 1.5 times of rated current, works for 5 seconds Short circuit protection: when the current of controller is more than or equal to 3 times of rated current, the protection starts. Anti- connection-reverse protection for solar battery and storage battery. As the cell panel is charged, the indicator light (NO.1) flashes quickly. The system is over-voltage. Please check whether the storage battery is well connected, or its voltage is too high. Please check whether the storage battery is well connected. The indicator light (No.2) of storage battery isred without output. The storage battery is over-discharged. The indicator light (No.3) of load flashes slowly without output. The load power is higher than the rated power. Please stop the operation of some equipment which consumes power, and then press the key for a longer time. The indicator light (No.3) of load flashes quickly without output. The load is short circuit and need to be adjusted. Then press the key for a longer time or wait till the next day, it will restart to work. The indicator light (No.3) is on continually without output. Please check whether the equipment which consumes power is well connected.